Gensho | Look up words by highlighting the ones you don't know. the words you don’t know. Gensho is the best way to build your foreign language vocabulary. Translate anything and build your vocabulary from real content. Five langauges. Now completely FREE. Because languages don't live in textbooks. Gensho is the ultimate reading comprehension tool for foreign language-learners. Any digital text will do – news articles, tweets, song lyrics; you name it – in Spanish, Japanese, French, German or Italian. Copy and paste the text into Gensho as a new article. You can save these articles to study later or read them immediately. Gensho will look them up as you read and save them for you to study later. Use the built-in flashcards that Gensho provides or download your words to use in your favorite flashcard program. By using real-life content, you can build your vocabulary from subjects that are relavent to your interests and your life. Want to use a different flashcard program? No problem. 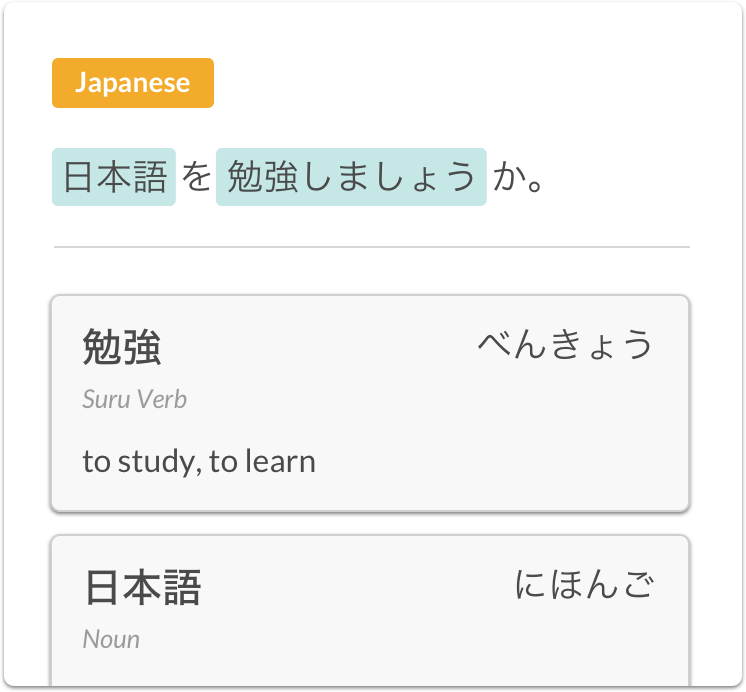 You can download the words you've highlighted and import them into your favorite app, such as Anki or Memrise. Seriously – any flashcard app will work. Use whichever one you like. Gensho gives you a universally supported file format (.csv) that all of them support. Five languages. Now completely free. Gensho can look up the English definitions of words from any of the following languages. You read that right – Gensho is now 100% free. Built by a digital nomad and language nerd. Annie Sexton, the founder of Gensho, is a web developer, writer, and travel enthusiast. She believes that language, above all else, is the key to connecting with cultures.